Oceanfront Dreams, couchers de soleil de contes et vues fantastiques à Key West! loved it. 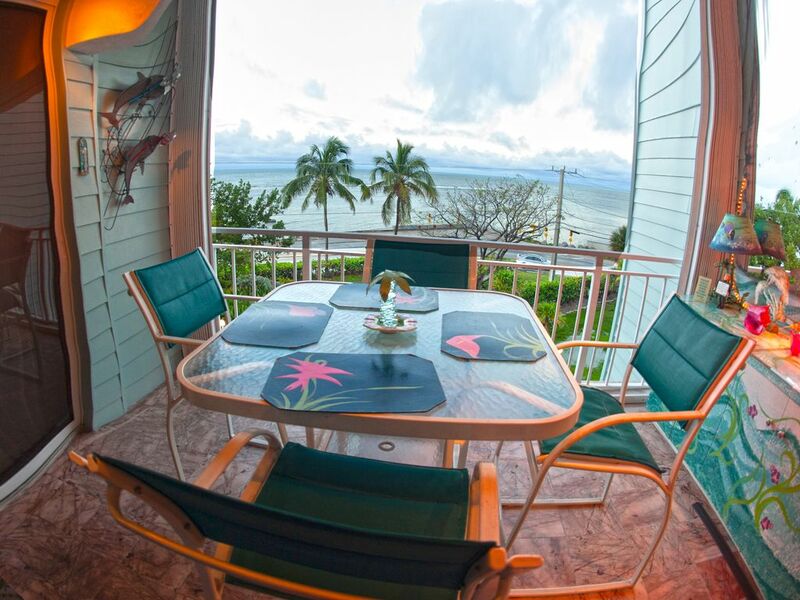 the perfect condo for a true key west vacation experience. the Costons are grate to work with and vary nice. and the people we meet at the condos were vary nice to. some of the automation on the lights, fans and electronics were a little confusing at first. and we did not find the little dimer switches on the light switches until the last couple of days. we thought the lights were broken. the bikes we did not use but it was nice to have them if we wanted them. the pool and hot tub area was vary nice and kept vary clean. we have gone to Key West almost every year for the last ten years. and this has been the best place we have stayed in hands down and are looking forward to hopefully doing it again. P.S. the balcony was so enjoyable i never watched T.V. the whole time i was there. Great condo for the money! Wonderful view of the ocean and beach. Wonderful view of the ocean and beach. The lighting takes a little experimentation to figure it out but is pretty neat when you do. Property is well maintained and the other residents are friendly and welcoming. Not a suitable [place for kids or wild partiers but great for a relaxing and fun vacation. The property was better than expected. We loved the myriads , dolphin decor. Truly Key West vibe. The apartment was impeccably clean. Had one small issue and they answered it immediately. They had the solution to me ASAP. Having a washer and dryer was priceless. We brought our own coffee and sugar but they had it there as well. The view was terrific and the folfe we met were very friendly. Thank you so much for your response sounds like you like our. place as much as we do! Clean. Nice view but can get traffic noise on busy street. Nice place, but does need some updating. The decor was a bit over the top with the beach theme and colors. A huge dolphin statue in the living room was odd and the life size stuffed doll mermaid sitting in the chair looking at you in bed was just weird. She was put elsewhere during out stay ☹️. The mattresses didn’t fit the beds. The building next to this one has its rebar working its way out of the concrete due to faulty construction (per a resident we spoke to who lives in that building) so it’s being held up by poles and scaffolding and iron reinforcements. It was a bit concerning that there was yellow caution all over the building on each floor yet there were people staying/living in those units which didn’t make sense. All in all, our next trip we will have to choose other accommodations. Condo was comfortable and well stocked. Very charming decor with a great view. There were a few things which needed repair including the disposer and bath exhaust fan, and dishwasher. All in all, we had a great time. Loved the pool and hot tub! Nice, clean condo, well equipped. Location was great, the salt water pool and hot tub were wonderful. The bikes are useless and need to be replaced. I would also suggest getting bigger number signs on the parking location was hard to see at night. The décor is quite festive and fun. The inside light switches were a little confusing but nothing that would stop me from coming back to this condo.